Quick and easy electronic pressure cooker recipe for family chicken fajitas. 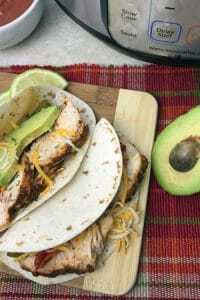 Quick, simple and tasty with homemade fajita seasoning. Pour water into the pressure cooker and place the trivet inside. Put the chicken breasts on top of the trivet. Sprinkle with 1 tablespoon homemade fajita seasoning. Top the chicken with the sliced peppers and onions. Sprinkle with remaining fajita spice mix. Close and set the valve to sealing. Set the pressure cooker to manual or pressure cook on high for 15 minutes depending on the number of chicken breasts. Carefully remove the chicken breast and vegetables from the pressure cooker. Place chicken breasts on a cutting board and slice or shred. Toss the chicken breasts pieces with vegetables and serve with tortillas and toppings.